To Cite: Mohammadi L, Bazrafshan E, Noroozifar M, Ansari-Moghaddam A. Application of Heterogeneous Catalytic Ozonation Process with Magnesium Oxide Nanoparticles for Toluene Degradation in Aqueous Environments, Health Scope. 2016 ; 5(4):e40439. doi: 10.17795/jhealthscope-40439. Background: Volatile organic compounds (VOCs) removal like toluene is an important concern for health of humans and the environment. Objectives: In this study, the efficiency of heterogeneous catalytic ozonation process (COP) with MgO nanoparticles for toluene degradation in aqueous solutions was investigated. Materials and Methods: Response surface methodology (RSM) using central composite design (CCD) was applied to study the interactions between critical operating factors and to find their optimum levels. Four independent factors namely pH, catalyst dosage, ozonation time and concentration of toluene were transformed to coded values and consequently a second order quadratic model was prepared for responses prediction. Results: The analysis of variance (ANOVA) of the toluene degradation by COP/MgO nanoparticles showed F-value of 19.53 for the quadratic model indicating that the prepared model is significant. The predicted result showed that maximum degradation of toluene (~99.99%) could be achieved at pH 12, MgO dose 0.5 g, ozonation time of 50 minutes and initial toluene concentration of 10 mg/l. The correlation coefficient (R2 = 0.9480) indicates a good correlation between the experimental and predicted values. Conclusions: According to the results, COP is an efficient and rapid method for removing of toluene from aqueous solutions. Volatile organic compounds (VOCs) are normally considered as toxic chemicals that cause several health problems. Between the common VOCs, aromatic VOCs embody an important group of hazardous contaminants. Most of these pollutants are considered malodorous, poisonous, possibly mutagenic, and also confirmed carcinogenic to human (1, 2). Monoaromatic compounds such as Benzene, Toluene, Ethylbenzene and Xylenes (BTEX compounds) were recognized as common VOCs and are very important (3). Furthermore, BTEX compounds constitute aromatic components in many petroleum products that are commonly found in groundwater sources. The presence of BTEX compounds in groundwater sources is usually caused by leaking underground storage tanks and pipelines, improper disposal of waste and leakage from landfill sites (4-6). Additionally, because of great solubility in aqueous environments comparative to other common hydrocarbons especially petroleum hydrocarbons, BTEX combinations can spread in water resources distant from the sources of contamination (7). Eicosapentaenoic (EPA) has been categorized as BTEX compounds, priority contaminants that incline to cause significant threat to the environment and also health of human because of their poisonous and carcinogenic features. Even at minimum concentrations, BTEX compounds can cause kidney and liver damage (4, 5). As presented by the world health organization (WHO), the maximum allowable concentration of benzene, toluene, ethylbenzene and xylene in drinking water is 0.01, 0.7, 0.3 and 0.5 mg/L, respectively (8). In addition, the BTEX-contaminated water bodies particularly groundwater sources indicate a severe pollution issue due to great carcinogenetic affects (9, 10). Thus, the presence of these contaminants in water sources is objectionable, and removal of these compounds with reasonable approaches is necessary. Among the BTEX components, toluene (or methylbenzene) is a typical VOC, which is harmful to humans (11). In particular, Toluene as a member of this group, is used as one of the most common solvents to dissolve paints, paint thinners, rubber and adhesives and causes numerous adverse effects on health of humans and the environment (12). During the past few years, considerable efforts have been made on the development of Advanced Oxidation Processes (AOPs) for water and wastewater treatment, particularly for the treatment of refractory organic compounds and recalcitrant compounds (13). Based on previous studies, AOPs are quite an effective technique for pollutants decomposition because of the hydroxyl radical (•OH) generation as the predominant species (14). Advanced Oxidation Processes are an economic process, quite effective and easy to use (15). Due to easy recycling (16), lower cost (17), greater efficiency of pollutants degradation (18), and ease of operation, catalytic ozonation process (COP) is considered as a novel AOP for water and wastewater treatment (19, 20). Indeed, COP can be regarded as a favorable AOP for purification of the environment. In this method, various catalysts decompose ozone molecules into hydroxyl radicals (•OH), which will react with organic materials in aqueous solutions in a non-selective manner (21, 22). On the other hand, COP promotes the hydroxyl radicals (HO•) generation from decomposition of ozone molecules, consequently overcoming the ozonation process limitations, including byproducts production and also inconsiderable efficiency for ozone consumption (23). It is well known that catalyst addition to the ozonation process increases the rate of oxidation, decreases the contact time and finally reduces the cost of treatment (24). A variety of metal oxides, including rare oxides, such as MnO2, CeO2, Ni2O3, TiO2, MnO2, Al2O3, CuO, V2O5, Co3O4, La2O3, Pr6O11, TiO2, Al2O3, ZnO, MgO, etc. have been selected and used as catalysts in COP (15, 25-27). Various parameters such as pH of the solution, temperature, nature of pollutants, dose and type of catalyst, concentration of ozone molecules and also shape of the reactor can affect the performance of COP (27). Catalytic ozonation has been classified as homogenous and heterogeneous (24, 28, 29). Each of these methods by direct oxidation (reaction of organic materials with ozone molecules) or indirect oxidation (via hydroxyl radicals generation) can stabilize different organic compounds (16, 24, 30). Heterogeneous COP is a kind of innovative AOPs, which has the capability to improve the ozonation of recalcitrant contaminants in the presence of various catalysts (31, 32). Furthermore, heterogeneous COP is an interesting method for treatment of different wastewaters because of its minimum cost, possible recovery of solid catalyst, and also minimum generation of secondary contamination. In fact, this process combines the molecules of ozone with the oxidative and adsorptive properties of metal oxide catalysts to attain mineralization of different organic pollutants at ambient temperature (33). Catalytic mechanisms are adopted for the COP, including acceleration of the production of hydroxyl radicals, complex catalysis, and the sorption of ozone molecules and organic matter on the surface of catalyst (15, 26). Magnesium Oxide (MgO), as a heterogeneous catalyst, has very good potential for destruction of different organic contaminants (34, 35). It is an economical, nontoxic and also environment-friendly compound. MgO has already been widely used for the treatment of wastewater (36). For example, catalytic ozonation using MgO nanoparticles have been used efficiently for removal of dye, phenol and formaldehyde (19). In the current study, the degradation of toluene using heterogeneous catalytic ozonation with MgO nanoparticles was investigated in a batch reactor. 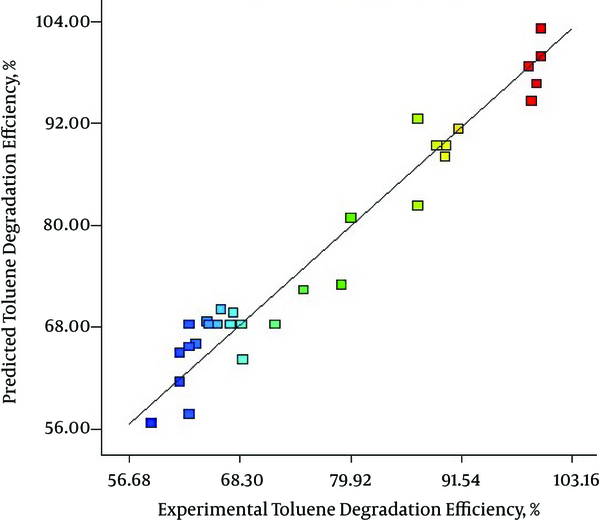 The toluene degrading performance was checked by determining changes in the degradation efficiency when the reactor was operated under various conditions. In addition, for this study, to design the experiments, analysis of data and optimal condition determination, Central composite design (CCD) and response surface methodology (RSM) were used. Several important factors including pH, catalyst dose (MgO), time of ozonation and initial toluene concentration were converted to coded values (as variables) and consequently second order quadratic model was prepared for response prediction (toluene degradation). Toluene (C7H8, 99.5%) and methanol (CH3-OH, 99.7%)) used in this work were procured from Merck. MgO nanoparticles were purchased from the Sigma-Aldrich company. The entire chemicals were used as received without extra pretreatments. For removal of any impurities, glassware were washed with chromic acid and rinsed with distilled water. Nanosized MgO was < 50 nm and a BET surface area analyzer was used for determination of surface area of MgO nanoparticles (120 m2/g). Catalytic ozonation was performed in a cylindrical glass column (Figure 1). The experiments were done at room temperature (22 ± 3°C) under batch mode, with 0.5 L of synthetic solution (with predefined concentration of toluene). Several critical parameters such as solution pH, MgO nanoparticles dosage, ozonation time and initial concentration of toluene were investigated. In the present study, MgO nanoparticles were used as catalyst for oxidation of toluene in the ozonation process. Furthermore, efficiency of single ozonation and adsorption by MgO nanoparticles for toluene removal were determined. 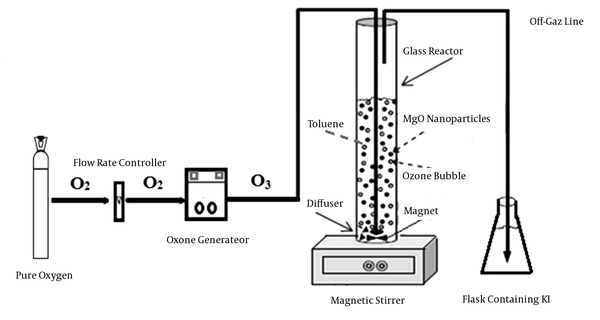 The ozone gas was generated from cylinder pure oxygen by the ozone generator (Pasargad model). Samples after predetermined reaction times were analyzed for residual toluene concentration. The degradation rate of toluene can be calculated via Equation 1, where Ct is toluene concentration after several regular intervals of time (t) and Ct = 0 is the initial concentration of toluene. In this study, toluene concentration as pollutant was analyzed using a headspace-gas chromatograph (Agilent 7890 A, Palo Alto, CA, USA) equipped with a flame ionization detector (FID), and an HP-5 capillary column (30-m length, 0.25-µm thickness, 0.32-mm I. D.). The pH of the solution was determined by a pH meter (WTW inoLab 7310). The RSM is a collection of mathematical and statistical methods designed for the modeling and analysis of problems wherein a response of interest is influenced by numerous affecting factors (37, 38). Determination of the optimal work settings of the system or determination of a region that satisfies the operational conditions are the key goal of RSM (38). The RSM has been used in various branches of science. For example, Gonen and Aksu (37), Anupam et al. (39) and Jo et al. (5), have efficiently used RSM for optimization of several factors for degradation of different pollutants. In the present study, four factors and three levels of full factorial CCD based on RSM was used and in total 30 experiments were done (including eight axial points, 16 factorial points and six replicates at the center points) to optimize the chosen variables, including pH, MgO nanoparticles dosage, time of ozonation and initial concentration of toluene. Based on the initial analysis, the range and levels used in the experiments are designated and scheduled in Table 1. In addition, the experiment settings, which were designed by using central composite experimental design (CCD) for survey of the effect of several factors and optimization of process parameters, are illustrated in Table 2. Where Y represents the predicted response (the toluene removal by the catalytic ozonation); β0 and βi are the constant coefficient and linear coefficient, βii and βij are the quadratic coefficients and the interaction coefficients, and Xi and Xj are the coded values of the independent process factors. This equation states the correlation between the independent variables in coded values and predicted response based on Tables 1 and 2. Furthermore, analysis of variance (ANOVA) was used for evaluation of the significance of quadratic regression model. Also, assessment of model terms was performed by the P value with 95% confidence level. Coefficient parameters were assessed by response surface regression analysis using the software Design-Expert (version 7) and Minitab (version 17); also applied to determine the residuals, 3-D surface and 2-D contour plots of the response models. where, X1, X2, X3 and X4 are pH, MgO dose, ozonation time and initial concentration of toluene factors, respectively. The quality of the fitted model was expressed by R2. 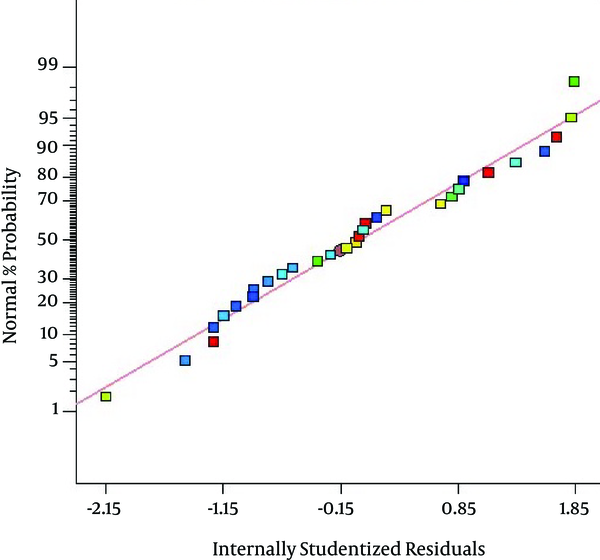 In the present study, RSM models were confirmed statistically for acceptability by using analysis of variance (ANOVA). The results are presented in Table 3. Abbreviations: SS, sum of squares; DF, degree of freedom; MS, mean square; RMS, ratio of mean square (F value). aAdeq Precision = 14.608, R2 Adjusted = 0.8994, R2 = 0.9480, Predicted R2 = 0.7144. Figure 2 indicates a plot of predicted value versus experimental value of percentage removal from response surface design, where the coefficient of determination (R2) was 0.9480. As illustrated in Figure 2, the data points were well distributed near a straight line, which suggested a good correlation between the experimental and predicted values of the response and showed a good agreement with the model. Also, as presented in Figure 3 the quadratic model used in this work well gratified the ANOVA. In the current study, the three-dimensional response surface plots were used to determine the interaction among four variables for optimization of COP with MgO nanoparticles. 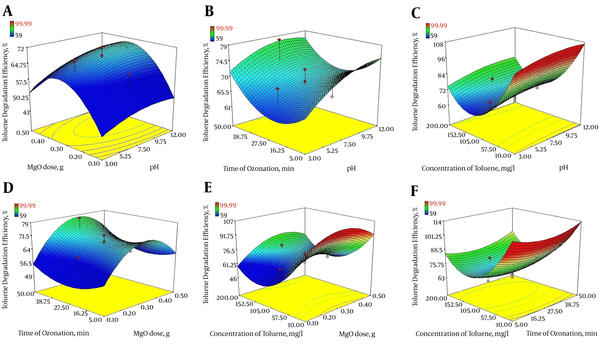 The results are displayed in Figure 4A - F.
Figure 4A presents 3D plots showing the effects of solution pH (X1) and MgO dosage (X2) on the degradation of toluene using COP with MgO nanoparticles, while the ozonation time (X3) and toluene concentration (X4) values were fixed at their middle level (X3 = 27.5 min, X4 = 105 mg/L). As shown in Figure 4A, with the increase of pH and MgO dose, toluene degradation efficiency steadily increases. At initial pH of 12, with consumption of more than 0.3 g of MgO nanoparticles, > 70% degradation efficiency was achieved. As it is clear from Figure 4B, with simultaneous increase of pH and time of ozonation, the degradation rate of toluene increased as well. Also, at pH values more than 12 and ozonation time more than 30 minutes, the increase of each of these two variables alone increased the removal efficiency, so that in alkaline conditions and ozonation time of 50 minutes, toluene degradation efficiency reached > 75%. 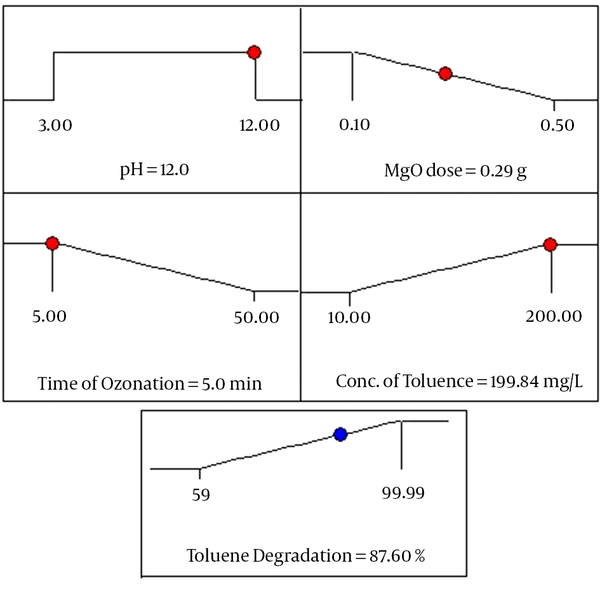 Additionally, as shown in Figure 4C, maximum toluene degradation was achieved at high pH (= 12), and lowest toluene concentration (10 mg/L) under fixed conditions occurred at ozonation time of 27.5 minutes and MgO dose of 0.3 g. On the other hand, toluene degradation decreased with increase of toluene concentration. As illustrated in Figure 4D, increased toluene degradation was observed with increased amount of MgO nanoparticles and ozonation time. At initial toluene concentration equal to 105 mg/L and pH 7.5, for reaction time of more than 50 minutes and MgO dose more than 0.3 g, toluene degradation efficiency reached about 75%. Figure 4E indicates the simultaneous effect of MgO dose as a catalyst and concentration of toluene on the rate of toluene degradation. Under fixed condition for initial pH of the solution (7.5) and time of ozonation (27.5 minutes), increasing the toluene concentration had a negative effect on toluene degradation so that at concentrations greater than 105 mg/L of toluene, despite an increase in the amount of MgO nanoparticles, process efficiency dropped. The 3D response surface plots according to two variables, ozonation time (minute) and toluene concentration (mg/L) is illustrated in Figure 4F, whereas the other two variables were kept at a central level (pH = 7.5 and MgO dose = 0.3 g). As indicated, the percentage of toluene removal increases with increase of ozonation time, so, the catalytic potential of MgO increased from 70.2% to 89.8% with an increase in the time of ozonation from 5 to 50 minutes, while, toluene concentration had a negative impact on toluene degradation. At present study, RSM models have been confirmed statistically for acceptability by using analysis of variance (ANOVA). Analysis of variance as a statistical method can be used as an exploratory tool to explain observations and testing hypotheses on the parameters of the model (40). The results are presented in Table 3. The F value was used for determination of statistical significance of the second-order regression model. As statted in Table 3, F value of 19.53 for the quadratic model indicating the significance of the model. In addition, a “Prob > F” lesser than 0.0001 for the second-order polynomial fitting shows that the model is statistically highly significant, and at 95% probability level, the model terms are significant. Values of “Prob > F” less than 0.05 show that the model terms are significant. Actually, the larger F values and the smaller P values showed significance effects of the corresponding coefficients (41, 42). Findings of the present work revealed that the regressions for toluene degradation was statistically significant since P values were < 0.05 with larger F values. The table of ANOVA acquired from the response surface quadratic model for COP in degradation of toluene demonstrated that the linear model terms (pH, dose, time of ozonation and initial concentration of toluene) and interactive model term (Dose*Conc) were significant (P < 0.05) while other interactive terms were insignificant to the response. Comparison of the experimental error of the replicate quantities can be performed by lack of fit (LOF). As stated in Table 3, the P value of LOF is more than 0.05 (= 0.1489), which confirm the significance of the used model. Additionally, “LOF F value” of 2.63 shows the LOF is non significant compared to the pure error. There is a 14.89% chance that a “LOF F value” this large can happen as a result of noise. Likewise, non-significant LOF is good. The LOF will be significant, if the model does not fit the data well. The closer the R2 value to one, the better the model will be as it will give predicted values, which are near the actual values for the response. Furthermore, a rational agreement with adjusted R2 is needed (43). The value of predicted (model) multiple correlation coefficients (R2 = 0.7142) is in accordance with the value of adjusted R2 (= 0.8994). “Adeq Precision” measures the signal to noise ratio. A ratio more than four is appropriate. Signal to noise ratio for the present study was equal to 14.608, which represents adequate signal (43). Hence, optimization of the operational parameters can be performed by the quadratic model. Figure 2 indicates a plot of predicted value versus experimental value of percentage removal from response surface design, where the coefficient of determination (R2) was 0.9480. As illustrated in Figure 2, the data points were well distributed near to a straight line, which suggested a good correlation between the experimental and predicted values of the response and showed good agreement with the model. As presented in Figure 3 the quadratic model used in this work well gratified the ANOVA. The residual plots revealed a standard distribution, lending support to the assumption that pH, dose, time of ozonation, initial concentration of toluene and Dose*Conc. are significant terms, whereas, pH*Dose, pH*Time, pH*Conc., Dose*Time, and Time*Conc. are non significant terms. In fact, if the points on the normal probability plot are placed near the straight line, it suggests that the model fits the data well. As indicated by Fig. 3, almost all points lie near the straight line. Hence, there is an excellent correlation between developed regression model and experimental values and consequently the regression models can be applied to calculate the degradation of toluene in the initial experimental conditions. The pH of the solution is a critical parameter in the catalytic ozonation process. In fact, the solution pH can affect the form in which organic compounds exist, the decomposition of the ozone molecules, and also the catalyst transformation (44). Also, it is well known that, ozone molecules can exclusively react with complexes of particular functional groups through selective reactions at acidic pH values. Under alkaline conditions, ozone molecules decompose yielding hydroxyl radicals, a highly oxidizing species that react with organic matters in a non-selective mode (15). On the other hand, it can be concluded that the alkaline conditions as well as the existance of a catalyst could stimulate hydroxyl radicals generation, which is satisfactory for organic matters decomposition (45, 46). Increase in the pH of the solution can accelerate the ozone mass transfer and also ozone decomposition rate through heterogeneous (catalytic) reaction. These reactions caused the formation of highly active radicals (HO• radical and others including OH, HO2 and HO3) and therefore can enhance the degradation rate of various pollutants (47, 48). Based on Figure 4A, B and C it was found that, the best pH for ozone oxidation of toluene by COP is equal to 12. In addition, evaluating the potential of COP demonstrates the significant catalytic potential of MgO on ozonation process in toluene degradation, against SOP and adsorption processes, especially at higher pH (~12). As reported by Zhao et al. (49), an increase in the rate of nitrobenzene degradation in COP using manganese as a catalyst was observed with an increase in the solution pH from 3 to 11. Similar findings were reported by Moussavi and Mahmoudi (27) on degradation of a reactive red dye using COP/MgO and also Asgari et al. (50) on humic acid degradation by COP using MgO. Nevertheless, optimum pH for phenol removal by magnetic heterogeneous catalytic ozonation was found to be at neutral and weak alkaline (pH 7 - 8) (51). Freshour et al. (52) and Wu et al. (53) described that increase in available hydroxide ions and also acceleration of the ozone molecules decomposition at alkaline pH values can enhance the generation of hydroxyl and MgO-hydroxyl radicals (as oxidative radicals) and hence increase the degradation efficiency of pollutants. (It must be considered that the suffix s in MgO-s indicates the Lewis acid site on the surface of MgO nanoparticles). As stated in the above equation, radicals produced in the reaction, all lead to a progress in oxidation of toluene. In fact, the formed radicals in the solution under these conditions initiated toluene oxidation (as indirect) with greater rates than those obtained with SOP (15, 24). Similar mechanisms were reported by other researchers for organic compounds degradation (27, 54). As shown, the effect of MgO dose was less than the ozonation time factor at minimum reaction times, so that at MgO dose of more than 0.3 g, and ozonation time of 11 minutes, 74.9% degradation efficiency was achieved. The increase of toluene degradation rate with an increase in catalyst dose can be attributed to the expansion of surface area of the catalyst and also the availability of more active sites for ozone molecules decomposition and subsequent reactions (18). In one previous study (21) on the catalytic ozonation of amoxicillin (with NH4Cl) and also phenol removal using magnetic heterogeneous catalytic ozonation by Dadban Shahamat et al. (51), similar results were reported. In addition, as presented by Rosal et al. (55), at fixed flow rate of ozone, greater increase of catalyst concentration can accelerate the ozone transfer from the gas media to the aqueous phase and also increase the decomposition rate of ozone molecules. Reaction time, which is the time required to achieve the preferred objectives of purification, is one of the most critical parameters that affect the design and operation of an oxidation process. On the other hand, Figure 4F demonstrates that with an increased ozonation time and a decreased toluene concentration, degradation of toluene increases. Similar conclusions were made (21) about amoxicillin antibiotic degradation and mineralization by the catalytic ozonation (with NH4Cl) and 4-chlorophenol removal using COP/MgO by Chen et al. (22). The results indicated that MgO nanoparticles extensively accelerated the rate of toluene degradation and are consequently a good catalyst to be applied for catalyzing the ozonation of model refractory contaminants. This catalytic potential of MgO in degradation of toluene could result in the presence of high density of basic functional groups that result in the decomposition of ozone molecules on the surface of MgO and also in the formation of active radicals (23). The optimum conditions for predicting maximum response (toluene degradation) have been achieved by using Minitab response optimizer as a global solution. Based on the software optimization step, the preferred objective for the operational conditions (pH of solution, MgO dosage, ozonation time and initial concentration of toluene) is chosen as “within” the range. The toluene degradation as response is defined as “maximum” to attain maximum efficiency. The program combined individual desirability to a single number and afterwards searched to improve this function according to the response goal. As illustrated in Figure 5, under optimized operational conditions, approximately 87.6% of toluene degradation rate was predicted by the model. The desirability function is found to be 0.6504 for the mentioned conditions as optimum. Furthermore, an extra experiment is then accomplished to approve these optimum findings, revealing agreement with the predicted response values. In the present study, the efficiency of heterogenic catalytic ozonation with MgO nanoparticles on toluene degradation in synthetic solutions was investigated. A central composite design with response surface methodology was used to calculate the relationships between major critical factors, such as pH of solution, MgO dosage, time of ozonation and initial concentration of toluene to recognize the best conditions for the operation. Based on the experimental data of this study, toluene degradation increased with increasing pH value, MgO dose and ozonation time. Nevertheless, performance of the process was decreased by increase of toluene concentration. The predicted result showed that maximum degradation of toluene (100%) could be achieved at pH 12, MgO dose 0.5 g, ozonation time 50 minutes and initial toluene concentration 10 mg/L. At this condition, experimental value was 99.99% for toluene degradation by COP. The correlation coefficient (R2 = 0.9480) indicates an excellent agreement between the predicted values and experimental ones. Additionally, the ANOVA of the quadratic model demonstrated that the used model was highly significant (P < 0.0001). At the optimum condition after process optimization by RSM, the efficiency for toluene degradation was found to be 87.6%. Finally, it was concluded that MgO nanoparticle is an efficient catalyst for toluene degradation and mineralization in the COP. This article was derived from the PhD thesis of Ms. L. Mohammadi, PhD student of health promotion research center, Zahedan University of Medical Sciences. All authors wish to thank Dr. Hossein Kamani, Dr. Ferdos Kord Mostafapou and Ms. Shahnaz Sargazi for their support during analysis of the study. Authors’ Contribution: The overall implementation of this study including design, experiments and data analysis, and manuscript preparation was the result of joint efforts by individuals, who are listed as coauthors of this paper. Funding/Support: The authors are grateful to the Zahedan University of Medical Sciences for the financial support of this study (Project No. 7391).